Authored by Julian Eisel (Severin) on Jun 23 2015, 5:50 AM. "Love" token, awarded by souvik. "Mountain of Wealth" token, awarded by januz. Note: Added a function that iterates over node "chains" (better name?) and calls a callback. We could use this in other places like node_select_linked_to_exec too, but will handle that separately. @Julian Eisel (Severin) @Sebastian Koenig (sebastian_k) @Jonathan Williamson (carter2422) Did we already define what keystroke activates / deactivates the functionality? Any proposals? I don't think we need to define a keystroke for it. It would be enabled by default, and to disable it there is a button. If someone wants a keystroke for it, it should however be possible to add one. A bit off-topic, but indeed, we should look at iconifying other options or move them out of the header if not used frequently (also for other headers). Don't hesitate to request icons from me. I won't guarantee that I will deliver immediately, but I should find time to do, lets say, 1 per week. How about using the render icon and putting small circular arrow ("FILE_REFRESH") on it? Sure. I'll cook something up and create a separate task for it. The feature is nice (I have to test it), but I woudn't set it on as default! As for the "which direction to move to make space available". 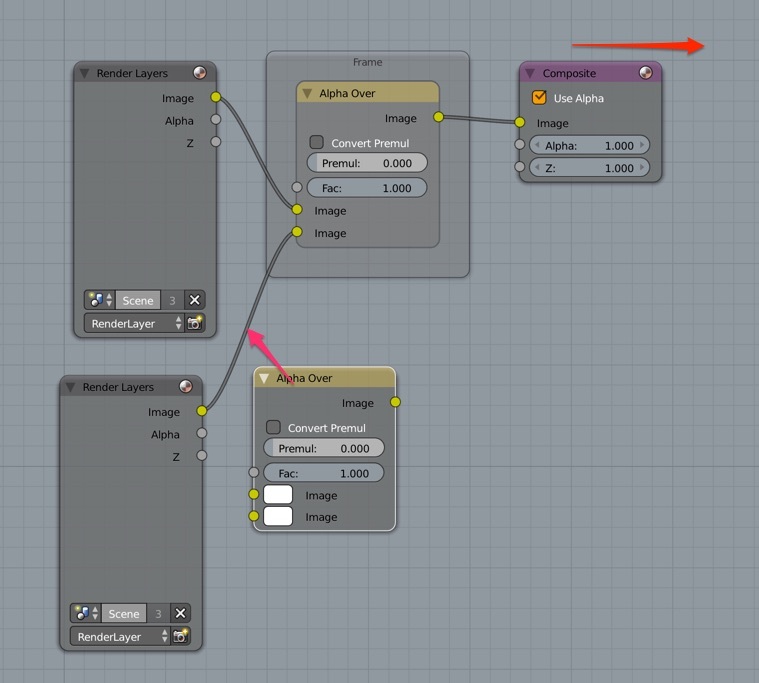 I think instead of option/button couldn't it be auto guessed and take into account over which node (previous or next) the user is hovering the node which he wants to insert? It would speed up the workflow. This looks like a very welcome and usefull addition, thanks for doing this. I would vote default on. Mere user here, so not sure if this is entirely feasible, or how much more work it would require, but if we could somehow get a 'live preview' of shifted nodes while placing newly created ones we could entirely avoid the need to have the option (or at least reduce the need to have it immediately visible). As @Michael P. (forest-house) suggested where the new node was dropped over a connection could determine which nodes were offset, if any. Placed more to towards the left of a connection would shift left nodes back, more to the right would move parent nodes to the right, and at some center threshold would disable the auto offset entirely (assuming corner cases of overlaping/close together nodes could be solved). I don't think that would work, because when you need to insert a large node like RGB Curves between too nodes which are already close together, it can be already tricky to even just get the proper highlighting of the noodle (and hence the triggering of auto-insert). Trying to hit the correct distance to the left or right node is impossible like that. @Julian Eisel (Severin), there is one bug still, which I didn't notice before. Adding a new node into a frame node still fails. 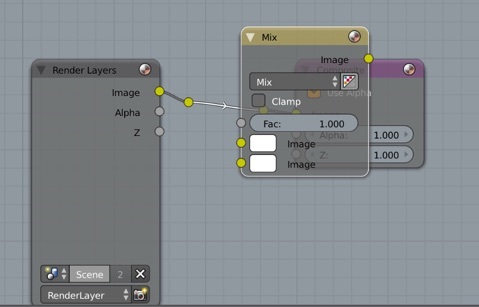 Duplicating nodes inside a frame node works great, but adding new ones messes up. I suppose that is because at the time of insert they are not yet child of the parent frame, so they fail to behave like they should. Probably they have to be parented to the frame first before executing the auto-offset thing. I didn't do anymore changes to icons or behavior yet, but I can add the left-side option + icon-button + shortcut next if everyone agrees on this? @Campbell Barton (campbellbarton), @Lukas Toenne (lukastoenne), added some more utility functions to node.c, but not sure if this is the best place for them? Awesome, thanks for fixing! Seems to work good now. The general consensus here seems to be, that a header button to enable or disable auto-offset would be okay (especially when there is some header cleanup like iconification happening anyway). Switching the direction with a second toggle next to it would be a reasonable solution as well. Even though it might be nice to have the system automatically guess in witch direction the node tree should grow, i think that would be too error prone. When I want to switch the direction it is because I want to have a certain layout, and for that I think the user should be in control. Having a button makes the option visible for the user, which is also good. Make it possible to toggle the direction not only with the button, but with a shortcut that you can press while hovering the node over the connection. The header bar info text should print the hotkey in the tooltip. Similar to the behavior of edge-slide, where you can press 'E' midway to tell whether it should be even or not. I would say that while a header button is where the main functionality should be toggled, direction changing could be better to have on a modifier key, like when sculpting for instance and changing the effect of the brush; meaning - standard functionality to be a forward offset, and the one with a modifier - backward. An info on this could be in the tooltip. EDIT: Oops, Sebastian already suggested it above. +1 to that, -1 to header direction toggle. Didn't implement a shortcut toggle yet, might do that tomorrow. Functionality wise it works really good. But yeah, a shortcut toggle would be better I assume. It is less busy than the previous one, but the other one was more descriptive. Would add ntreeNodeFlagSet(tree, flag, bool) to use for enable/disable. For these kinds of iterators, it can be handy if the callback can return false as a signal to early-exit. Wouldn't alloc data here, it can just be stack-mem and passed in as an arg. Not sure this is worth a typedef (its not used and fairly obscure setting). With the last update we only have the ability to toggle the direction while translating. We could also add this as a normal shortcut to make it accessible without translating, but then we'd need a visual indicator like another (icon-)button in the header. We can do this easily of course, just wasn't sure if that is what was desired. Great! I would be fine with it like it is, but just want to mention that it is not consistent with other tool toggles. Usually the options that you toggle with a hotkey during transform, such as cut through with knife tool, are not permanent but only relevant during that one operation. Once you start the knife tool again it is set back to "normal". So, while I don't mind how it works currently in node offset I think that for consistency's sake the direction toggle should only be active during one transform operation and then go back to normal. I second that and @Julian Eisel (Severin) s comment about the header icon: I'd like to take the snap tool again as an example. We have a main tool (snap/auto offset) that is customizable for every subsequent use of it (snap to grid, component / auto offset right / left), so a direction specifier combobox ,next to the icon seems right to me - @Jonathan Williamson (carter2422), what do you think about it? Another minor thing I'd like to see changed is the Hotkey "T". "D" seems much more ideal for the direction to me as we try to use always the first character of the action in our tools to toggle them on / off. Apart from that - really awesome functionality, much needed! I don't think a box for the direction is needed. It's not like you'd continuously edit your trees to the left, the main direction is right by design. So it's mainly a few occasions where you'd move to the left. Pressing the toggle for that I think is still okay. that maybe the case in your workflow, but you can't generalize this - as we have an infinite node space in every direction and we have users that come from ltr-languages as well as rtl-languages you can't predict how they build their node tree. If they like their nodes to offset generally to the left or to the right is a cultural habit and not at all by design. Even if the node execution itself seems to be from left to right that does not need to be reflected in the offset direction. Therefore I still vote for a specification combobox. The alternative is to break the modal tool design (where your settings are normally reset on the next call) just like @Julian Eisel (Severin) did it just now - that would be acceptable too maybe but should be approved from our ui team. Personally I don't like to see design principles broken though. 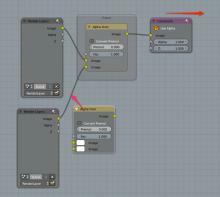 I do think though that the node editor IS in fact design from left to right - otherwise we could swap the inputs/outputs. And I have yet to see one single screenshot of someone working our nodes right to left. Designing for corner cases isn't also good design IMHO. @Thomas Beck (plasmasolutions) Actually, I misinterpreted your reasoning about left<-->right direction. Of course one can prefer to have output sit fixed and add nodes to the left. In that case the current behavior of toggle would be fine, but different from other tool-toggles. Using a menu is clunky from workflow point of view though. Yeah, that was a misinterpretation caused by two Germans that are talking in English ;) And just to prohibit further misinterpretation: Having a left / right combobox does not mean for me that you won't have a modal toggle possibility via a hotkey - that would be still needed.. But does that mean the toggle during transform like it is now can stay as long as there is a toggle box in the header too? Rather than waiting on input/decisions from other UI-team members, I think we should work this out on ourselves. The decision making process within the UI-team doesn't work reliably enough to make further development depending on it, unfortunately (speaking out of own experience here - not pointing fingers, just being careful with creating dependencies for projects). The discussion is open and if they feel like giving input they can always do so. Re shortcut: Don't like to use D because it's already used by GPencil. This may not give us a conflict for this, since it's used as a modifier key there, but these overlapping shortcuts are the main reason why our event system is such a can of worms (see sticky keys) and I'd also like to keep this unassigned for further GPencil development. In the attached image I try to insert a node into the lower connection. The frame is not pushed to the right, but the composite node is. @Campbell Barton (campbellbarton), think this is ready for further review now. Wow, everything seems to be working now! Also my issues from yesterday seem to be gone now. Generally good, requesting changes though. Having this as a theme option seems rather odd since its not for drawing. This is related to interactions, I think it belongs in the Editing section. Looks like this is a memory leak? This should be NULL'd in readfile.c incase Blender autosaves or somehow writes the value to disk. Worth commenting this is temporary/runtime data too (could put under linkdrag so temp data's grouped). Note that this is basically used to pass an argument from one operator in a macro to another. Couldn't this use subtype PROP_PIXEL ? It could, but since node_margin is multiplied with UI_DPI_FAC it's not really a pixel distance. I checked other cases and it seems we only use for DPI independent values. 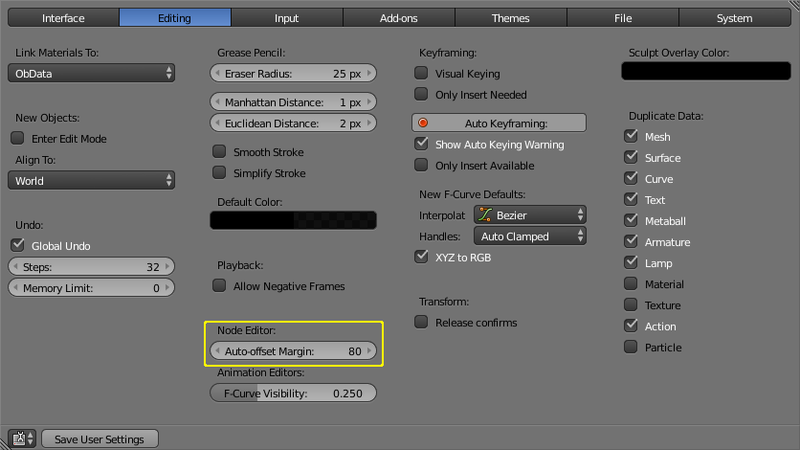 Julian Eisel (Severin) mentioned this in rB47bc66fc8dfe: Note Editor: Auto-offset nodes on insertion. D780 Initial step for new modal op info API: Get shortcuts from modal keymap.